Yes, I went a little crazy with the syrup. But that’s just how I roll. That’s the kind of death-defying, selfless act that it takes to get you, my fans, the best information on Chicagoland food and drink. And fine food it is, this is the Crunchy French Toast from Wishbone (West Loop). Gosh I love Wishbone. I also love Southern comfort food. I’ve been lucky enough to have traveled a little in the south and they eat my kind of food down there. I like sugar, cream, and hot stuff (not necessarily together), and they just have more of that down there; more donuts, more blackened stuff, more bread pudding, and more hot sauce. I like it. When I’m south of the Ohio River, I feel like I’m with kindred food spirits. Didn’t I feel kind of the same in Greek town? Am I just flinging loads of bull or what? It’s crunchy because they dip it in ground corn flakes after it comes out of the standard French toast batter. This addresses one of my major gripes with French toast (aka, eggy bread for those in the UK). 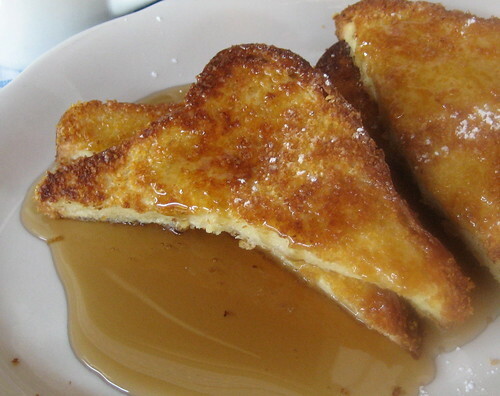 Often, when the battered toast is drenched with prodigious amounts of syrup, the toast gets saturated with syrup and loses its bread-like consistency. It turns into a runny mess actually, especially if the batter-master missed a portion of the bread and allowed some bare bread to peak through the coating. Not good. Comfort food blasphemy in fact and I will not tolerate it. Not to worry here at Wishbone. The corn flakes add another barrier to syrup-saturation and add a crunchy texture to one of my favorite sweet breaky items. Crunchy-sweet is a great flavor sensation. Not quite as powerful as salty-sweet, but they could go toe-to-toe in my house anytime. How ’bout a battle royale between a frozen Kit-Kat and some Garrett’s cheddar cheese-caramel combo popcorn. It’s not necessarily a fair fight because the Garrett’s option is actually crunchy-sweet-salty, and that’s like the triple threat of flavor sensations…like the Carl Yastrzemski of sweet treats. When was the last time you were at Wishbone? I was just looking through their lunch menu and they have Black Bean Cakes. Wow, that sounds good, I gotta get back there fast. Posted in food on 2007/08/18 by John.